President Barack Obama will soon lay out his vision for federal spending when he releases his annual budget, setting in motion months of debate over the size and scope of government. Rand Paul is doing the same thing. The tea party hero is at the bottom of the Senate in seniority and was sworn in as Kentucky’s junior Republican senator only two weeks ago, but he’s about to unveil his own sweeping budget plan that would result in a $500 billion cut in just one year — about five times more than what the House GOP has promised to do. It’s an unusual move — a rookie senator releasing his own version of the federal budget — but it says a lot about how Paul is trying to carve an unconventional identity in the stodgy Senate. As he tries to navigate Senate politics, Paul faces a key question: Will he use his national profile to paint himself as a conservative firebrand and perennial outsider, or will he work within the system and with senators across the ideological spectrum to settle for less ambitious deals? So far, he’s showing signs he’ll do a little of both. Paul’s version of the federal budget — which he’ll unveil as early as next week — would target programs at virtually every federal agency, including the Defense Department, and would eliminate the Education Department. He plans to follow up with a five-year budget with even deeper spending cuts, a move likely to prompt backlash from groups that would be affected by his proposal. Like other Republicans, Paul is pushing a constitutional amendment to force Congress to balance its books, calling for a two-thirds-majority vote to increase taxes. And he plans to float bills that would kill certain federal regulations. Breaking from most lawmakers, he also wants to force a debate over instituting a limit of two terms for senators. And he’ll propose establishing a waiting period before lawmakers cast major votes and forcing them to read legislation. “These are not without ambition,” Paul told POLITICO in an interview. With these proposals, Paul is clearly moving to make a down payment on promises he made as a fire-breathing campaigner, when he vowed to drastically change the Senate from its core and force a dramatic belt tightening on Capitol Hill. But none of them are expected to go very far in the Democratic-controlled Senate. And with Paul lacking seniority in the Republican Conference, the real test for the new senator is how he adjusts when his more ideologically driven ideas stall and it’s time to start legislating. Paul said the fact that he’s never served before in elective office is a distinct advantage. Paul enjoys one of the biggest national profiles in his class of 13 Republican freshmen, thanks in part to the fervent grass-roots following of his libertarian-minded father, Rep. Ron Paul (R-Texas). Another junior senator with national name recognition is already hitting it off with the younger Paul: liberal Minnesota Sen. Al Franken, the former “Saturday Night Live” star, who attended Paul’s reception earlier this month after Paul was sworn into office. Each new senator is paired with a Democrat and a Republican to learn the Senate’s ways, and Paul has asked Franken to be his Democratic mentor. Paul, 48, said that “the way you win battles is by talking to independents, conservative Democrats and maybe even some liberal Democrats who might agree with you on occasion. “So I think I will surprise some people,” said Paul, who also is trying to work out an arrangement with the Senate ethics committee so he can keep practicing as an eye surgeon in Bowling Green, Ky.
As he tries to woo his less conservative colleagues, Paul will have to be careful not to disappoint his tea party supporters. DeMint has made waves by engaging in firebrand politics in urging his national following of conservative activists to pressure Senate Republicans to take hard-line stands, but senators typically are put off when they perceive that one of their colleagues is undermining them. Whether Paul’s tactics resemble DeMint’s remains to be seen. But the Senate is, well, the Senate, meaning senators like to be courted and wooed so they can tweak measures and join as co-sponsors and eventually get credit for certain proposals. It’s not clear that Paul is doing much of that with any of his early proposals. However, Paul isn’t completely freelancing — he has kept Senate Minority Leader Mitch McConnell (R-Ky.) in the loop so far and is continuing to build a positive relationship with the senior senator from his home state. Already, the Republican leadership is embracing some of Paul’s rhetoric. At a closed-door Senate GOP meeting at the Library of Congress, Republican Conference Chairman Lamar Alexander of Tennessee cited Paul’s calls to “expand prosperity” when talking about America’s “exceptionalism” and the deep spending cuts that the GOP will push. But Paul didn’t roll with the punches after a May appearance with MSNBC’s Rachel Maddow in which he took issue with the 1964 Civil Rights Act’s reach into private business, inciting an onslaught of criticism. Paul later backtracked, reiterated his call for equal rights and largely ducked the national media for the rest of the campaign. Free from campaign pressures, Paul said he welcomes the scrutiny. President Barack Obama, Rep. Paul Ryan (R.-Wis.) and Rep Michele Bachmann (R.-Minn.) all made presentations to America as part of last week’s State of the Union festivities. The one-two punch of Ryan and Bachmann was a strong counter to the flurry of new spending proposed by the President. The President pitched yet another massive new government spending program as “our generation’s Sputnik moment.” Obama bragged that he will send a budget to Congress with increased spending in “biomedical research, information technology and especially clean-energy technology.” The President’s Sputnik reference sent many of his younger supporters to the history books and left many analysts scratching their heads. Bachmann repeated a plea from the Tea Party that “after the $700 billion bailout, the trillion-dollar stimulus, and the massive budget bill with over 9,000 earmarks that the President signed, many of you implored Washington to please stop spending money we don’t have.” Well, the next year will be a moment of truth for President Obama to see if his Sputnik moment becomes the “read my lips” moment of the Obama presidency. The Congressional Budget Office (CBO) reports that spending is rising, as is the annual deficit. Obama can brag during his reelection run that he has set a new record for Washington: $1.480 trillion in debt for fiscal year 2011. That number shatters his prior record from 2009: $1.416 trillion. Ryan’s House Budget Committee staff crunched the numbers and found that “budget deficits are projected to be $1.48 trillion for fiscal year 2011 (the current year), or 9.8%GDP. The deficit is $186 billion higher than that of 2010, entirely due to a $252 billion increase in spending. Even with the two-year extension of existing tax rates and other provisions enacted in December, tax revenue increases by $66 billion from 2010 to 2011.” This would indicate that the President’s statement in the State of the Union address that “I am proposing that starting this year, we freeze annual domestic spending for the next five years” just isn’t enough. If we freeze in record debt, then this nation will be on pace to default on our debt obligations, not on pace to shrink the $14 trillion national debt. That promise to freeze spending, coupled with the President’s new “investment that will strengthen our security, protect our planet and create countless new jobs for our people,” will bankrupt our nation. Sen. Pat Toomey (R-Pa.) has rolled out an idea to make sure that the United States doesn’t default on debt if the debt limit is not increased in March of this year. His legislation, the Full Faith and Credit Act, will prioritize payments of the debt if the debt limit is not raised from the current level of $14.3 trillion. The first priority will be to pay off the principal and interest on debt held by the public. In a letter to Toomey, James Valvo of Americans for Prosperity writes, “As you have skillfully articulated, the country has more than enough tax revenue coming in to cover the interest on the national debt. We will not default, period. The United States’ credit rating is far too important for administration officials, the media or elected officials to use it for political purposes.” This legislation shows that lawmakers are not forced into a vote either on raising the debt limit or defaulting. Toomey is providing a third way to make sure that senators and representatives have an opportunity to use the debt-limit increase to force some real cuts on this free-spending administration. 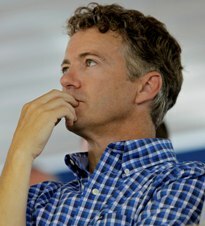 Sen. Rand Paul (R.-Ky.) has a proposal to slash $500 billion from the budget this year. His legislation, (S.162), would terminate federal funding for education and housing, not constitutional functions of the federal government. Paul eliminates the Government Printing Office, cuts the food stamp program’s “erroneous and fraudulent” payments, eliminates Amtrak subsidies, eliminates the National Endowment for the Arts, shutters the Corporation for Public Broadcasting and ends the National Endowment for the Humanities.